One of the many obstacles to subsidiarity, or quite simply to free enterprise, is state paternalism which could be a close relative of statism. Paternalism as a phenomenon, however, is not confined to politics, and invades practically all the mass media and information at large, because it is a typical forma mentis of forms of totalitarianism. We see this from an early age. When accessing one social platform or another on Internet, we are very frequently welcomed by a phrase like this: “Dear user, you are important for us, as are the memories you share here. We thought you would have liked to relive this post dating back three years”. These are widespread attitudes also in marketing and publicity. The word ‘paternalism’ – from the English word ‘paternal’ – began to be used in the XVIII century by current affairs journalists to single out the attitude of absolutist sovereigns who advocated all administrative and political tasks to themselves. The Chinese president Xi Jinping launched a massive campaign of mass indoctrination to “social-Communism with Chinese features”: the closing of churches, a mudslinging campaign against religions, the walls of stations and public places covered with quotations of his words, the introduction of lifelong presidency, personality worship, and the manipulation of school books. Chinese people are so used to the new cultural revolution that they don’t even notice it any more. In Italy there are no quotations from Mao on wall posters or the like, but alive and well since 1971 has been Pubblicità Progresso. Just take a look at its website and discover the various paternalistic lures. During the five year period from 2012 to 2017, PP proposed the following: “Organ and tissue donations” (education to altruism), “I count on you – First phase of the campaign for gender parity focused on gender discrimination” (education to feminism), “I count on you – Second phase”, “I can – sustainability, sobriety, solidarity” (education to ecologism), “I Can Squad – battle against improper behavior” (education to good manners). Using a slogan is the preferred literary form for the success of the PP’s campaigns, much like the refrains or nursery rhymes used with children. “A little is all it takes to make your future grow, one deed after another”, “Being a woman is still a complicated craft. Let’s give it its true value”, “The first form of discrimination is to deny it exists”. There is no room for formation, but only information in order to convey a predigested message hammered home so it will be memorized and turn into persuasion. All the rest broadcast by general service TV channels or radio stations apes the same format. Talk shows, round tables, and commercial advertising: quick slogans repeated so they can be memorized, and often yelled out to highlight the emphasis of this or that communicator. There is really no need to point out that the world of politics uses the same means: phrases worked out by bigwigs at the drawing board, and then repeated by spokespersons as if they were parrots. Nonetheless, the State (or the Nation) is Father to a certain degree, and this is evident in our civilization: ancient Rome conferred the honorary title of Pater Patriae; the nation is also called ‘fatherland’ (the word is used in articles 52 and 59 of the Italian Constitution); the father’s last name is ordinarily handed down from father to children; we also have “parental authority”. The Father is present to such a degree that in order to reform society, the movement in 1968 had to throw it off its pedestal. Diego Fusaro, a Marxist philosopher above suspicion, argues that social-Communism had not rejected the figure of the Father as modern liberals would like to do today. In the Cuba of Che Guevara, he writes, “wasn’t there a Communism with an openly patriotic basis?” “Wasn’t the fatherland or death programme the privileged way against imperialism made in the USA?” Then there was Antonio Gramsci’s distinction “between nation and fatherland, country and patriotism”: he “enhances the nation without being a nationalist”, and in no way believes that “in order to avoid male chauvinism and paternalism it is necessary to eliminate the figure of the male, the father, and, in more general terms, the family, etc.”. Therefore, if nationalism is a degeneration of the Nation, paternalism or patriotism are the degeneration of Father. Moreover, it isn’t possible to eliminate the analogy between the individual components of the family and those of the State or society, since human family is necessarily based on natural family. Immediately understandable in this sense are expressions similar to “sovereign-father”, “citizens-children”, king and queen – father and mother”. In this regard, the word nation stems from the Latin word “natus”, the past participle of “nasci” (“to be born”). The Nation is therefore “the generation of persons born in a same region”, where birth presupposes a father and a mother. Equally and evidently understandable is the fact that the etymological meaning of “economy” comes from the Greek word “oikos”, that is to say ‘house”, the family’s abode. All the more so should those citizens who are Christians more easily intuit what are the foundations of creation, and hence social life itself under the lordship of the Father, the Son and the Holy Spirit. From the viewpoint of the Social Doctrine of the Church in particular, “Christ reveals to human authority, always tempted by the desire to dominate, its authentic and complete meaning as service”, in the sense that “God is the one Father, and Christ the one Teacher, of all mankind, and all people are brothers and sisters” Hence, “sovereignty belongs to God”. “The Lord, however, “has not willed to reserve to himself all exercise of power. He entrusts to every creature the functions it is capable of performing, according to the capacities of its own nature. This mode of governance ought to be followed in social life”. According to the Father’s plan, therefore, those who govern “should behave as ministers of divine Providence”. After all, it isn’t difficult to understand these principles if we keep in mind the dynamics of family life, where it is the office of the father and mother to exercise authority over their children, but without staunching their legitimate and free aspirations or initiatives, or, in Christian terms, vocations. In fact, God is Father, but not master. Diego Fusaro, “Elogio gramsciano del padre e della patria”, Il Fatto Quotidiano, 14/11/2017. Cf. Ottorino Pianigiani, Vocabolario etimologico della lingua italiana, Albrighi & Segati, 1907, voce: “Nazione”. Pontificio Consiglio della Giustizia e della Pace, Compendio della Dottrina sociale delle Chiesa, n. 383. Ibid., citazione di: Catechismo della Chiesa Cattolica, n. 1884. Leone XIII, Ecyclical Letter Immortale Dei, 01/11/1885, n° 5. 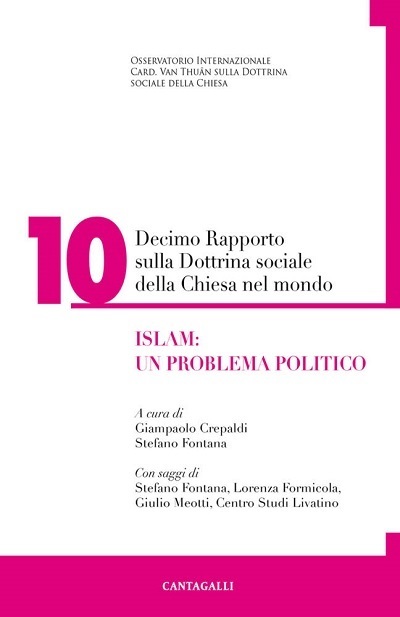 Ibid., citazione neotestamentaria di Rm 13, 1. Leone XIII, Lettera Enciclica Rerum Novarum, 15/05/1891, n. 28.